This is an acid reflux surgical malpractice lawsuit filed against Prince George's Hospital Center in Prince George's County It was filed in Maryland Health Claims Arbitration on January 24, 2017. The complaint alleges lack of informed consent and negligent surgical decisions. This lawsuit is the 41st medical malpractice case filed in Maryland in 2017. Plaintiff, a 52-year-old morbidly obese man, goes to his gastroenterologist with difficulty swallowing and gastroesophageal reflux disease. The gastroenterologist schedules an endoscopy procedure. The plaintiff is diagnosed with esophagitis and a hiatal hernia. The gastroenterologist refers plaintiff to a surgeon. Plaintiff goes to Prince George's Hospital Center to have surgery done to repair a hernia. Defendant surgeon informs him that he is going to do the surgery, a procedure called a Nissen fundoplication. Nissen fundoplication is a procedure in which the upper curve of the stomach is wrapped around a section of the esophagus and stitched in place. The purpose is to strengthen the lower esophageal sphincter's closing function. The idea is to strengthen the valve between the esophagus and stomach to stop acid from backing up into the esophagus. So when the stomach contracts, the esophagus is closed off instead of squeezing stomach acids into it. The surgeon never attempts to perform the procedure laparoscopically. He begins the surgery via an open procedure. He is unable to complete the surgery, as he finds the repair to be "too tight," so he stops the procedure. He attempts to convert to a Hill gastropexy procedure instead, which would repair the anti-reflux valve by securing the junction of the esophagus and stomach to the abdominal cavity. The procedure that the defendant actually employs is not a traditional Hill gastropexy and is not a recognized procedure. 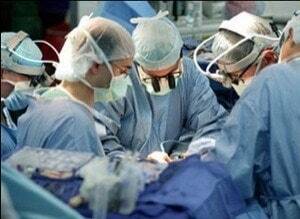 After the procedure, the defendant surgeon uses Vicryl sutures to secure the stomach to the diaphragm. Vicryl sutures are used during some surgeries to close the incision. Vicryl sutures are "absorbable" which means they do not need to be removed because the dissolve into the body as the incision heals. Plaintiff is recovering in the hospital from the surgery when he collapses while walking to the bathroom. He goes into septic shock, is intubated, and then sent to the ICU. A CT scan shows a leak from his stomach into his abdominal cavity at the suture line. Defendant surgeon attempts to repair this and uses a vacuum-assisted closure to close the plaintiff's abdomen. Four days later, the VAC bursts open so severely that plaintiff's bowel becomes visible. He is transferred to University of Maryland Medical System. Plaintiff has several surgeries at the University of Maryland to repair his condition. As a result of the leak, he suffered a large incisional hernia in his abdomen and severe pain. Many gastroenterologists do not recommend the Nissen fundoplication because it has a 20% failure rate. The more common plan for reflex is dietary controls, not eating late at night, reducing caffeine, and eating smaller meals. The path for most patients also involves acid-reduction medicines like the proton pump inhibitors such as like Nexium or Prevacid although this class of drugs has certainly had its fair share of problems. The Complaint does not detail the man's history with reflux so we do not know if he tried these drugs and did not get a satisfactory outcome. One reason why the Nissen procedure often fails is that if the surgeon wraps it too tight, the patient struggles to swallow. So the surgeon does a "three-quarters" Nissen to make it looser. But this increases the risk the Nissen will not hold. This had to be a concern in this case because the man already had difficulty swallowing which may be why the surgeon was concerned the Nissen was too tight. Often surgeons will convert from the Nissen to a Hill gastropexy because they have cut somewhere they did not intend to cut. Such a perforation is often not malpractice. It is unclear why the used of absorbable sutures would be a breach of the standard of care. Certainly, they are often used in a Hill gastropexy. Doctors often do an open surgery when they are unsure where they are cutting so they can properly identify the structures. It is certainly odd that he would set out to do a laparoscopic procedure and then convert to an open procedure without even trying to do the procedure laparoscopically. It is hard to know what the doctor found before the operation that he did not know before the patient signed the informed consent. Have you suffered due to the negligence of a doctor? Miller & Zois can help you get the compensation and justice you deserve for the harm that you have suffered. Call us today to have your questions about medical malpractice cases answered at 800-553-8082. You can also get a free case review online.